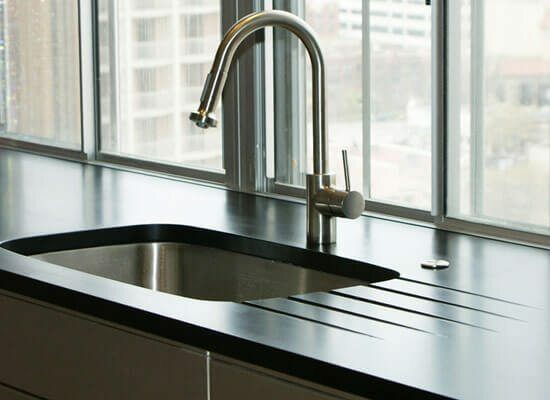 If you are considering a kitchen remodeling project for your home and are searching for the perfect kitchen countertops for the project then Domicile can help. Our home remodeling showroom has a large display of kitchen cabinets, kitchen countertops and kitchen displays to spark your imagination. Looking for the perfect kitchen countertop? Domicile offers a large selection of options to choose from as well as an experienced Kitchen Designer, Ken Burghardt, who is able to match your tastes with a new kitchen design. Whether you like the appearance of wood or want fully customized countertops made from sustainable materials for your modern kitchen, Domicile offers full service benefits from design to product selection making the entire process easy for you. Kitchen counters should not only accommodate your cooking needs but also add beauty and elegance to the business room in your home. The type of countertop you choose for your kitchen is a crucial decision for overall design and functionality. We offer a large selection of cabinet and countertops suppliers that offer products made from sustainable materials. PaperStone manufactures its material from 100% post-consumer recycled paper that has been saturated with their proprietary phenolic resins. PaperStone’s non-porous surface provides a lifetime of stain resistance and absorbs virtually no water. In addition surface cuts or mars can be easily sanded or rubbed out with an abrasive pad leaving surfaces looking new. PaperStone designs and manufactures their products in Grays Harbor to be good for the environment and good for the earth. They are committed to making innovative products competitively affordable and globally accessible. Domicile actively seeks suppliers and other partners who share our values. Collectively, we can change the economic landscape and make a difference in the world.